Y’all know I am all about the monthly beauty boxes!! I love them. Getting the deluxe sized samples help introduce me to new brands, new products and are amazing for my travels! For those who are unfamiliar with these beauty boxes, monthly they are sent to your house with different deluxe samples and full sized products. 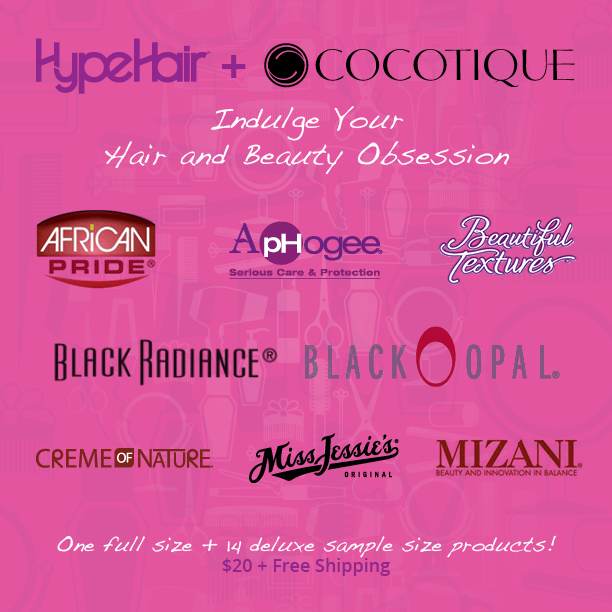 COCOTIQUE is partnering up with Hype Hair Magazine for the EXCLUSIVE Limited Edition June Box! The June box includes eight brands, including one full size and 14 deluxe sample size hair and beauty products from: Black Radiance, Miss Jessie’s, Aphogee, African Pride, Beautiful Textures, Creme of Nature, Black Opal, and Mizani I am a fan of literally all of these brands so I am super excited to get my box! Enter below and you could win a box! Good Luck!